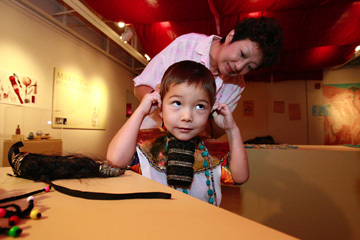 Volunteer Emmy Andrews helped Ka'eo Wongbusarakum, 4, try on an ornamental beard similar to the ones Egyptians wore, during a tour of the Museum Learning Center at the Honolulu Academy of Arts. Want to learn to walk like an Egyptian? Adorn yourself in a tunic, fancy collar, jewels or even a leopard skin? First-grader Sasha Cox did just that, dressing like a queen, making a canopic jar and even translating her name into hieroglyphics, all part of the fun of Honolulu Academy of Arts' educational program that also involved puppeteer Quala Lynn Young sharing tales about the mummification process with the help of "Tut," a mummified cat puppet. Place: Honolulu Academy of Arts Gallery 30, 900 S. Beretania St.
Notes: Tours are limited to 25 people. Reservations are required. These particular activities were part of the "Tut the Mummy" exploration of Egypt, following a tour of the museum's "Art and Afterlife in Ancient Egypt" exhibit. "It was an incredible supplement to our lesson plans," said Sasha's mother, Norma Cox, who home-schools her daughter, getting to know her every interest in the process. "I just loved making the jars out of clay, but I was most interested in the cat with the earrings," said Sasha. "I also loved dressing up." "She loves mummies; she has some odd interests," said Norma. "She was fascinated with the Titanic for a while." Supin Wongbusarakum brought her 4-year-old son, Ka'eo, on the tour. "He liked the puppet the best," she said. "We normally come to the art programs, and thought we would give this one a try." The material is geared toward elementary school children. "It seems to span the ages quite well," said Young. Younger children might be scared by the descriptions of the mummification process -- like how a hook is run through the nostrils to remove the dead individuals' brains. The ancient Egyptians, it seemed, considered the brain to be a worthless organ. Meanwhile, the heart was left in the body because it was considered to be the center of intelligence and emotions. Other organs were placed in canopic jars, or funerary jars, of various designs. One bearing a lid in the design of a human head contained the liver, another with a baboon lid held the lungs, the jackal held the intestines and the falcon housed the stomach. Each organ was linked to a particular deity. 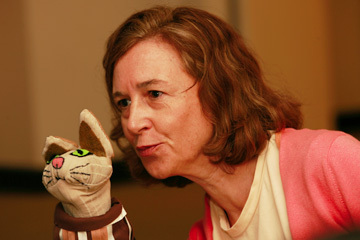 Puppeteer Quala Lynn Young and "Tut," the mummy cat, explained the significance of various Egyptian gods. The tour also taught the children about the "Ship of the Dead," tombs, how to make papyrus paper and the weighing of one's heart through good and bad deeds. They also learned about "ushabtis," small mummylike figurines buried with the dead to represent servants. Mummies were buried with 365 ushabtis, a servant for each day, to ensure business as usual in the afterlife. "Tut" kept things light to take the edge off some of the dark subject matter. Carolyn Whitney, a docent volunteer at the academy, brought her two grandchildren, Catherine, 4 and Siena, 6. "About 30,000 children go on tours each year," she said. A museum can be an intimidating place for a kid, but the puppets make it more approachable, Young explained, saying the goal of the new puppet tours is to provide children with a positive museum experience. "We want them to realize that the museum is a fun place to learn," said Young, who has an extensive background in the arts and works as a public and private school art ambassador for the academy. "I've studied dance, theater and the visual arts. It is fun to bring them all together. It makes everything come alive for them." Her three-part program brings traveling art exhibitions to children. "First, we go into the classroom with a trunk full of artifacts. The 'museum in a box' allows a child to hold, touch and share the artifacts. "Secondly, the group of students visit galleries in the academy associated with the (school) discussion. Lastly, they make a craft project related to the culture of study." She has presented the program to schools from Sunset Beach to Punahou. "We want to make education available to all children of Hawaii," she said. 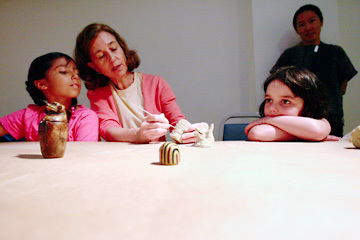 Quala Lynn Young shows Sasha Cox, 7, how to make a canopic jar while Madeline Nielsen, 4, and Supin Wongbusarakum observe. The project is part of the "Mummy Talks" tour at the Honolulu Academy of Arts. Saturdays: At 10:15 a.m. June 17; July 1, 15 and 29; and Aug. 12; and Wednesdays at 1 p.m. June 14 and 28, July 12 and 26, and Aug. 9. For preschoolers to third-graders. Call 532-8792. Tours are limited to 25 people. Reservations are required. Story time: 2:30 p.m. Tuesdays through Sundays in Gallery 31, Banyan Court, Lower Level. Storytellers choose a book to read from the museum's collection of children's books. Families are welcome to browse through the shelves for books about art, artists, cultures and stories from around the world, during museum hours. Special themes are used to focus on new ways of exploring the academy's galleries. Activities include treasure hunts, storytelling, make-and-take craft classes and entertainment, 11 a.m. to 5 p.m. one Sunday a month. Free admission. » June 18: "Talk Story" focuses on "Faraway Places," an exhibition of Jerry Pickney's award-winning children's book illustrations. His original illustrations in "The Nightingale" transport folks to Morocco. "Rikki-Tikki-Tavi" is about a mongoose that lives in India. And "Journeys with Elijah" travels with a prophet to Europe, the Middle East, China and South America. » July 16: "There's No Place Like Home" focuses on furniture, tales and the kinds of things you find in the home. » Aug. 20: "O Fire!" looks at art created with fire: ceramics, glass and metalwork.